LOW COST DRIVER & HARDWARE FOR THE ORBITRON PROGRAM COMMAND TWO TV ROTORS IN A PORTABLE SATELLITE TRACKING SYSTEM IDEAL FOR FIELD DAY. The intention to enter the world of satellites and space at low cost, led us to develop a driver for the program Orbitron able to command two rotors of moderate price, thus, making a system for the following of Satellites, Moon, Sun etc. The complete system of components hardware are purchased from the market and should not exceed € 400.00. With the use of reasonable gain antenna, the system optimizes the contacts from horizon to horizon and frees your hands. The system consists of a software driver that can be downloaded on the link page above. This Driver extracts every moment the Azimuth and Elevation of the satellite selected in Orbitron and sends them to a micro-controller board that will control the rotor-controllers through a system of LEDs indicators PCBs installed over the rotor-controllers. We are preparing a manual that explains how to assemble all the kit, install it and operate. In the following lines we describe the development of the idea for a Mule prototype being that, in the end, we will have a system with 3 Printed Circuit Boards (PCBs) with all the electronics so, it just will be needed to assemble the parts according to the instructions manual. The green signaling shows compensation wich means that the Azimuth rotor is in a reverse rotation to avoid winding of the cables around the mast. Before the compensation, this window previously notifies the operator that will carry out a compensation by coloring orange. The SINC button is active in orange color, when the driver is openned . It is desirable, before the passage of any satellite, to do the compensation and synchronization . - Low cost system for satellite tracking. - The system is a Kit that can be mounted by any ham with minimal knowledge. 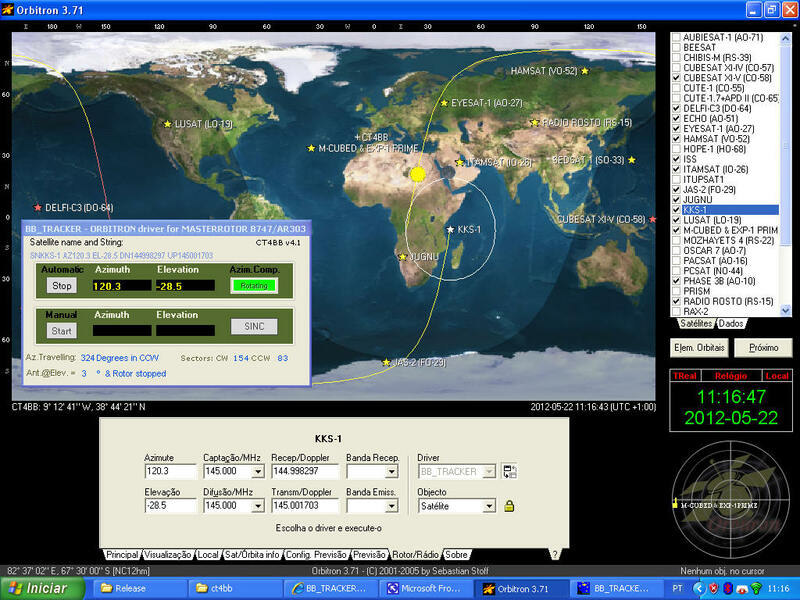 - Driver works with Orbitron which is a satellite tracking program available for free downloading on the Net. - Rotors used are type TV MASTERROTOR models B-747 or AR-303 which are well suited to the VHF and UHF antennas. - The system has a precision of + - 3 ° that is more than sufficient for the opening angles of the antennas with 13 elements. The total cost of the System wil be about 400.00 €. - Our KIT with 3 assembled PCBs, and accessories for 170,00 € (Packaging & shipment included). - Time and patience to assemble the kit cost (€?). - Rotors are low cost, so, at the end of a 360 ° movement some +- 5º comulative Azimuth error will happen . However, this error does not affect the tracking of satellites with antennas openings of +- 6º at -3dB which are just the type of antennas we use for VHF and UHF for Amateur Satellite Comunications . - The antennas should be installed so that, the center of gravity of the boom must stay on the elevation rotor, to avoid slippage. 3 - Suitable for use in tracking LEO satellites. 4 - To modify rotors, it is only necessary to open the azimuth rotor and saw the two locking pins. 5 - The system can be synchronized and do not winds cables around the mast.It makes an automatic "Unrolling". 6 - The placement of the Led PCBs is simple: just remove the buttons and the contacts of the controllers and place there the PCBs. 8 - The system can be also be remotly controlled by entering the remote PC over the Internet..
Hardware and software needed for the portable system. 2 PCB/s with position LEDs for the Azimuths and elevations to mount in the controllers. 1 PCB Mother Board equipped with a microcontroller to place inside the chassis, or box where will be all the assembly. We have built our prototype on a wooden board. - An old PC power supply can be used where we take the 12 volt ~ 2 A minimum. - 5 Flat Cables with 16-conductor with 2 x ICD16 female connectors to connect the microcontroller PCB and the Led position PCBs. - 2 x 10 meters of cable UTP CAT5 4 pairs to send the control voltages to the rotors. With 2 Power connectors and one DB15 male connector. ( You can avoid the multipin connectors, connecting the cable directly to the Rotors terminals 1,2,3). - 1 Driver with free Download here to be installed in the PC following the instructions. The program BB_TRACKER is a Driver that runs under Windows and is inserted in the Orbitron configuration. The driver receives data from Orbitron and sends them to the PCB equipped with a microcontroller that commands the controllers of the rotors for the azimuths and elevations. The rotors and the controllers have synchronous motors. For azimuths, we made a printed circuit board with 60 position green LEDs in circumference at 6 degrees angles (Sectors of 6º) which are sufficient to maintain tracking of satellite antennas with lobes of + - 3 degrees @ -3 dB. The elevation PCB have 15 LEDs corresponding to 15 sectors of 6º. In the rotating disk of the controllers we installed a photodiode which detects the LED light stopping in the center of the respective sector. The software always calculates the shortest route around 360 degrees and walk accordingly. The program also warns that will carry out a reset of turns for compensation, in order to avoid winding the cables around the support of the antennas. 1 - Turns on the LEDs of the azimuth and elevation where the rotors should move to. 3 - Actuates the relay RL3 and RL4 to define the direction of the rotors movement : In azimuths if it is CW or CCW. In the elevation if it is 90 ° upwards (UP) or down to 0 ° (down). When the photo diode reaches the lighting LED, it sends an information to the microcontroller to disable all the devices previously activated. The relays RL5 and RL6 are intended to cut off the current from the rotors keeping the controllers working to synchronize the system. - Extracts the data through the protocol DDE (Dynamic Data Exchage) in a Satscape string format. - Inserts data in the reading windows for viewing. - The software also compares current data with the previous one to know which way is shorter to move the rotor (CW or CCW). It also calculates the number of sectors CW and CCW to where the rotor will be sent. It calculates the travelling of the azimuth rotor to notice to do a RESET and avoid cable turns around the mast. - Even after turning off the PC, the data of the Last Position of the antenna is stored. - In the case of the Last Antenna Position values indicated by the program does not match the actual orientation of the antenna, it is because something has been forced. To fix it, just press the knob SYNC (when in orange) that will synchronize the system . - Button-Start / Stop to trigger the automatic tracking from Orbitron data. - Start-button to activate the manual system with the windows where are inserted the intended azimuths and elevations. - Button-SYNC to synchronize the actual orientation of the rotors with the controllers. It uses a Software Driver running with Orbitron, a microcontroller in a PCB accessed by the PC USB port, which controls the modified Controller Box. The Software Driver receives data from Orbitron processes it and sends the commands to the microcontroller which, in turn, sends data control to the Rotor Controller. The concept is to replace the original controller button with an hardware which simulates the manual operation. This is done replacing the rotable controller dish with a PCB with leds which represents the centre of angle sectors. In the white plastic rotable dish we put a photodiode which detects the activated led and stops. We divided one complete turn of 360º in 60 sectors of 6º each for the azimuths and 90º 15 sectors for elevations. The reason for the sectors is to permit an antenna pause between +- 3º of satellite passage inside a 6º arc. 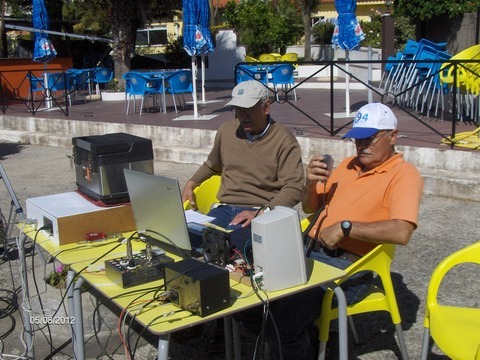 For example: the sector 5 will be between 24º and 30º and the antenna will be pointed in the midle 27º during the passage. As soon as the satélite azimuth is out of the sector, the software driver sends a command to the microcontroller to activate the next sector led and the (white plastic) dish of the controller runs 6º and stops. The driver catches the data from Orbitron with the DDE protocol in the Automatic mode or catches data from the windows in the Manual mode. The movement of the azimuth rotor is free from any mechanical limitation so, it will be possible to turn more than 360º around without being interrupted in the middle of a satellite pass . However, the cables that feed antennas are not to be wrapped around the support. The software will reset automatically back 360º the orientation of the antennas whenever it reaches a complete cable turn around the support. To prevent that automatic resets occurs during the satellite passage, the RESET button will become Orange to recommend a previous RESET before the satellite horizon view, allowing tracking it completely without the interruption of a reset. In the Manual operation, the Azimuth and Elevation are inserted in the windows to command the antenna position. The SINC button is to synchronize the physical antenna position with the system data. It can occur with heavy wind or data loss and the software position do not corresponds to the physical antenna position. NOTE : This type of Rotor is not recommended to work horizontally. However its use has no revealed mechanical damage declared. Interior of Rotor controller with synchronous motor and rotor button. Phototransistor placed . Screws were removed because are not necessary. The sleeve stands the fototransistor. Photodiode will run down and around the leds. Note : These two PCBs are a prototype design and will be replaced by the new comercial PCBs shown above. Since this is a prototype, to make changes and corrections, the assembly of the circuit is quite triky and we used flat cables. After testings a double-sided PCB will be built. Exterior microswitch installed in the Azimuthe Rotor. The cam (ledge) switches on the stop at zero. The Brown and Brown/White wires belongs to the UTP CAT5 cable. Wiring the UTP cable to the rotors. In both rotors, connections are the same. Note : These numbers are the numbers of the Pin connectors and the number of the DB15 Pin also. They are note the numbers of the Rotor terminal. The Green to the pin 3 . The Brown and White/brown wires will connect to the microswitch opened contacts in both rotors. Back view of the prototype Box.